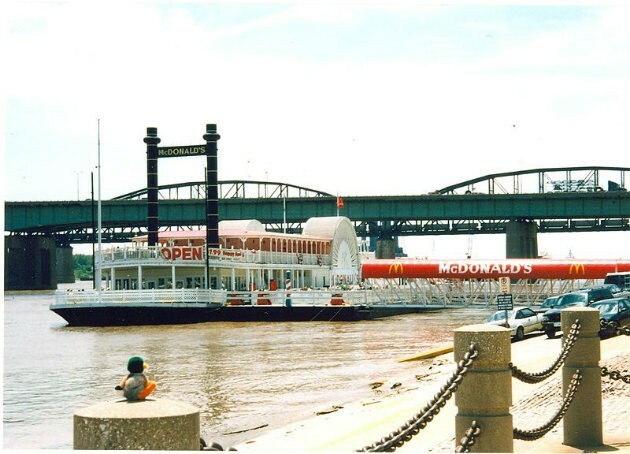 The Floating McDonald's in its glory days on the riverfront. Somewhere, ripped apart in a scrapyard heap, the pinnacle of our youthful dining dreams from the 1980s lays, rusting away into oblivion. At least, that’s what we can only presume happened to St. Louis’ floating McDonald’s, the crown jewel restaurant for local kids growing up in the days when a pre-rapture Kirk Cameron was still OK with having his doe-eyed mug splashed across heathen teen magazines. No one is really sure what happened to the floating McDonald’s, which ruled the banks of the Mighty Mississippi for twenty years until it was unceremoniously decommissioned in 2000. Heck, at least the floating Burger King, which for a brief moment rivaled the home of the Big Mac in our riverfront “burger wars" (no, seriously), had the decency to go out in a blaze of glory, breaking free from its moorings and smashing into the Poplar Street Bridge during the flood of ’93. But the floating McDonald’s merely closed up shop in 2000 and faded away to join that great Hamburglar in the sky. That his selections evoke such visceral reactions is no surprise to Collins, a native of New York state who moved here 22 years ago after college, following a friend who was a St. Louis native. Collins developed much of his list by interviewing locals on their memories and seeing which places were mentioned with the most frequency. According to Collins, the floating McDonald’s was at the top of the list. Collins laughs at his theory on why the floating McDonald’s enjoyed such immense popularity, but he may be onto something. For kids growing up in the ‘80s, before fast-food was anathema to parents, having lunch on the closest thing to the open seas in St. Louis transformed a crappy burger into the taste of freedom. Sure, there were times in the heat of summer when the scent of fryer grease mingled with boat diesel and washed-up catfish for a less than fresh effect. But who cared? 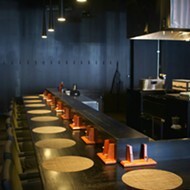 Sitting on the outside covered deck (why on earth would you dine inside? 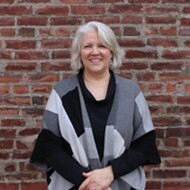 ), you were Becky Thatcher or Huck Finn, filling up on provisions before hitting the open river in search of adventure. Never mind that McDonald’s “riverboat” was actually a McBarge, built to look like an old-fashioned paddlewheel. And though its popularity in St. Louis made it seem like a winning formula, the concept never really took off outside of town. McDonald’s attempted to launch the McBarge idea at the 86 Expo in Vancouver, but the then-$12 million floating restaurant languished in port for several years before being decommissioned and left to float eerily in the middle of an inlet just outside the Canadian city. There are rumors that the St. Louis’ floating McDonald’s Canadian brother is getting a second life as a new restaurant — an idea those of us in the Gateway City can only dream of being true of our beloved french fry vessel. For now, all we can do is bask in the glow of memories and radioactivity we probably picked up from eating industrial while breathing in barge exhaust. Lost Treasures of St. Louis can be purchased at Left Bank Books, STL-Style, the Novel Neighbor, the A-B Brewery, and many, many other local retailers. You can also purchase it online at reedypress.com.